hey guys one semi-correction I have to make: I have my wastegate solenoid mounted on my strut tower in a way that is upside down compared to the way it is bolted to the FD UIM from the factory. So I guess the "top" and "bottom" hose barbs on the solenoid are reversed from what you would see on the factory FD configuration. Normally the plug is on the top, not the bottom like in the way I have mounted it after cutting the bracket. the " inlet pressure " hose is that with the 90degree alighment and the 'out " to the "T" is the one oposite to the connector? i will try to replicate the same setup as yours.for now the car has a mechanical valve that i want to replace with pcf wastegate control with a stock solenoid. single niple at the turbo outlet ----> "T"
other side of this "T" -----> wasgate side port. 2)---> can i retain this pressure source from the turbo housing and plumb as you describe or move it after the IC parhaps at the throtle body? i am planing to use 10-14 psi for now. i read somewhere that the pressuse sourse to wgt from the turbo outlet results boost spikes . Whatever mechanical valve you were using before (ball and spring manual boost controller? ), you need to take out. It's going to cause problems. The pressure source you are using, which will go to both the factory solenoid and the side port, can come from before or after the intercooler. You may need higher duty values to reach a target boost if your pressure source for the plumbing is after the intercooler. Take a look at this. Does that clarify things? The other diagrams I posted wre correct, but they may have been confusing because I mounted my solenoid upside down. I assure you that this is correct for an FD. 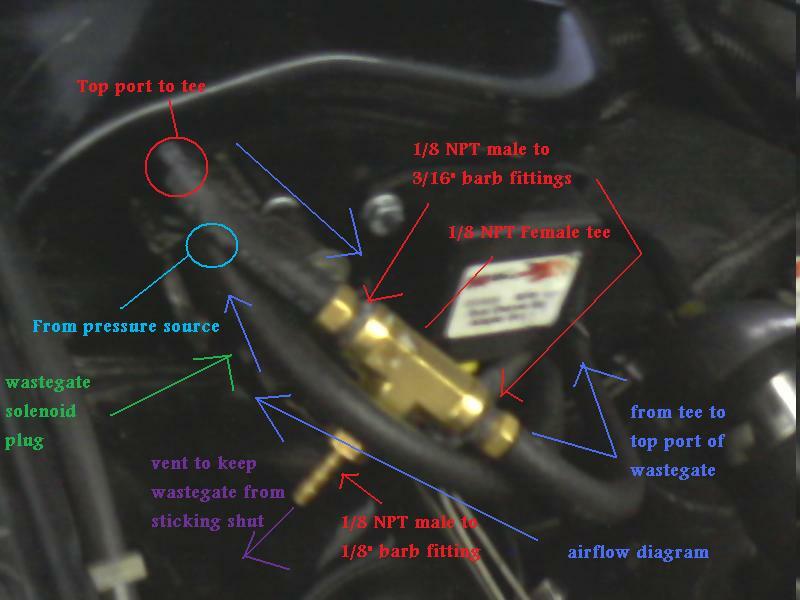 Now, sourcing pressure from before the intercooler would be the same plumbing diagram basically. It can cause problems with some boost controllers, but that is more likely on ones that have a vague "boost" setting but do not let you directly set the solenoid duty (Greddy, Blitz, etc). Apex'i (AVC-R and PFC) and AEM boost controllers (AEM EMS and AEM Tru-Boost) for example let you set an actual boost control solenoid duty. There are tradeoffs in both designs. If you are really concerned about overboost, source the pressure from after the intercooler and start with a low duty cycle value. So answer this question for me: You are in Europe and I have no idea what kind of plumbing fittings are commonly available there. 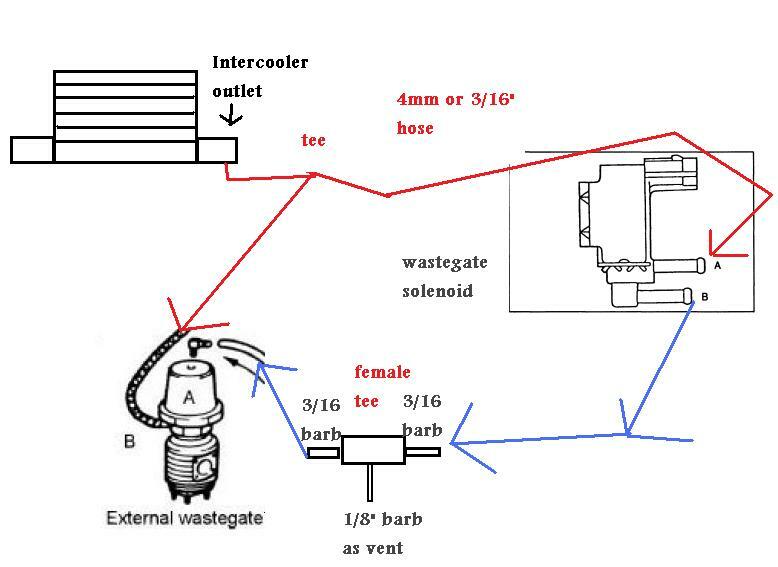 What are you going to use for the vent tee I have depicted here, the yellow thing? You can see in that diagram that I have mounted the solenoid upside down but the plumbing is the same as the other two diagrams I just posted. Give me the EXACT fittings you are using, just as I have done in the picture with all the NPT stuff. Also, what is your wastegate spring pressure and what size is your wastegate? Telling me this information will give me a better idea of what pressure and duty settings you may want to start with. Your sequential turbo settings transitions in the Datalogit should be 1800 low and 2000 high (I said 2500 earlier, that will work too), with sequential turbo enabled. Guys a genius! Thanks alot! I wanted to share my experience on this topic as well, although I know it is old. Thank you for the resource, it was extremely helpful. I did things slightly different, but the general idea is the same. Use the wastegate control solenoid with the PowerFC to control boost on a single turbo. The general details of my car are in my signature. Here is what I did differently. The top port of my wastegate is open to atmosphere. The bottom port of my wastegate solenoid is open to atmosphere (will dump it to the intake at another date). The top port of my solenoid is T'd into the line between my wastegate (side port) and pressure source (compressor outlet). Using the same settings posted in this thread (sequential operation and transition settings). Setup like this, with a 10psi spring pressure, 20% duty cycle netted me 12psi, and 90% netted me 14psi. being that I run 16psi low and 20psi high, this wasnt going to cut it. I used the turbo precontrol restrictor (.059") pill in the line off the compressor housing (boost source). This got me 16psi at about 40% duty cycle and 20psi at about 55% duty cycle. Still some fine tuning to do with boost dropping off up top (may need different duty cycle settings, or a smaller pill), but I was able to get into the ballpark VERY quickly. I am a fan of that. Good to hear. Using the restricter pill to meet your needs was resourceful. You can use whatever boost control solenoid you want in whatever arrangement you choose really. You can use the popular and relatively cheap MAC solenoid in various configurations. You can use the stock 2 port in various arrangements. You can use a pill or not use a pill. It comes down to your understanding of the system--beginners, be careful. FYI, Banzai Racing informed me that you can plug into the factory precontrol solenoid plug. Then you can turn off "Sequential turbo control" and the transition settings no longer matter. Interested to hear what you figure out for the boost dropping off up top. Im loosing a couple psi at high rpm also with pfc single turbo boost control and would love to get it to hold full boost to redline. chances are, a smaller restriction will be required to hold it. I'm using what was immediately available, but i'll probably swap it out for a .045" welding tip. I bought an FD with non-seq conversion and the stock vacuum system mostly removed. The wastegate control and turbo pre-control solenoids are gone. 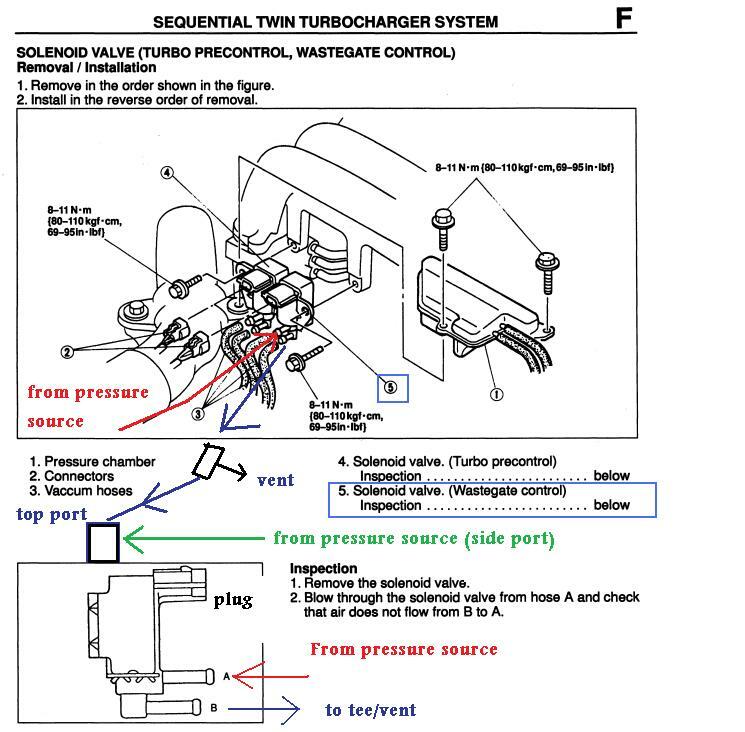 Instead the turbo control (as labeled in the manual and on Atkins) solenoid is used as far as i can tell. also reference manual (F) page 190 item #8. "Turbo Control" is listed as on the solenoid rack. This turbo control solenoid has vaccum lines routed to the wastegate for wastegate control. The pre-spool waste gate is removed as is the flapper than would block off exhaust routing to the rear turbo. What are your thoughts on this set up for boost control? I'm not sure if that solenoid behaves similarly to the factory pre control and wastegate solenoids. It may be basically the same part, or close enough not to matter. I would think that this arrangement should be fine if tuned appropriately, but I haven't driven the car or seen any datalogs. Quick question, if I have the precontrol as the boost controller what PSI spring should be in my wastegate? Looking for around 330whp single turbo and im more about response than power. Turbonetics T66 turbo with a 46mm TIal wastegate. I would go with either 11.6 or 13 psi assuming you have all the supporting mods. Personally I would go with the higher psi, but your power goals att the moment aren't really high. An electronic boost controller will keep the gate closed until the last moment, this will give you the fastest spool up time. This helped me out alot! I had this but without the vent and was just terrible boosting in 3rd to the point I could only get to 4500 rpms before cutting out. Now it runs through smoothly. AC compressor operation with Power FC - fixed without the relay mod!